Donald Trump and Hillary Clinton aren't moving the stock market. Oil is. Investing experts say that the latest moves in crude following the agreement by OPEC to freeze production is the biggest factor behind the market's recent mini-rebound. The latest polls showing Clinton expanding her lead over Trump? Noise. The same might even be said about what the Federal Reserve and other central banks around the world plan to do with interest rates. The Fed is likely to raise rates in December. Other central banks are probably staying on hold. There's little mystery there. But the big move up in oil prices over the past few weeks has boosted energy stocks. That's key since weak earnings from big companies in the oil patch are a big reason why Corporate America's overall profits have been falling for the past few quarters. Exxon Mobil (XOM) and Chevron (CVX) -- two of the Dow 30 stocks -- rallied on Monday as crude prices rose. And they both fell Tuesday as oil prices gave back some of those gains. The Dow was down 200 points in late day trading Tuesday -- a loss of more than 1%. But oil still remains above the psychologically important level of $50 a barrel. Burt White, chief investment officer for LPL Financial, wrote in a report this week that the so-called earnings recession could soon be over thanks to rising oil prices. He said the September spike in crude "may help energy companies, including energy infrastructure companies in the industrials sector, meet or exceed expectations." But is the oil party already almost over? Some are worried that prices may come back down soon. TD Ameritrade chief market strategist JJ Kinahan thinks it will be tough for oil to keep rallying as investors will start to wonder if the recent gains are sustainable. After all, there have been numerous head fakes regarding oil production in the past few years. 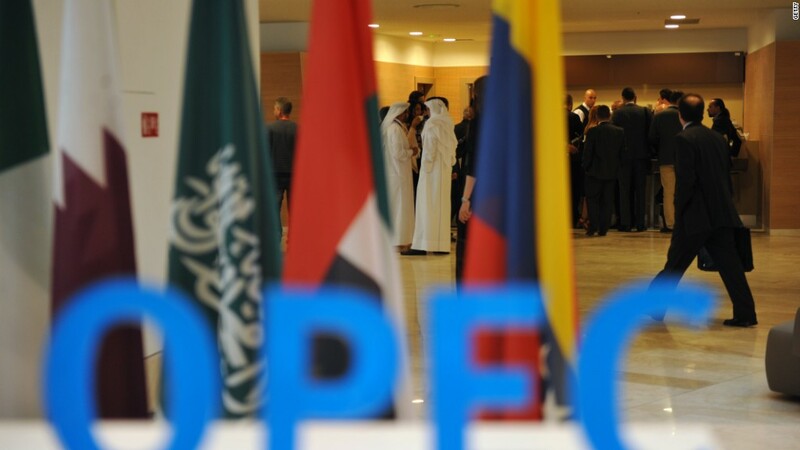 OPEC members have often said they would cut back on oil, only to keep pumping. It's not clear if big shale producers in the United States will play ball and limit production either. Another concern? Oil may be in a proverbial sweet spot right now. Prices are high enough to lift profits at energy companies, but not so high as to cripple consumers demand for gasoline. "A new range of, say $45-60, should be a 'Goldilocks' scenario for the world economy. This would be high enough to keep major producers afloat and justify renewed investment in the oil sector," wrote Julian Jessop, chief global economist at Capital Economics. "Consumers should therefore find something to cheer too," Jessop added. "These levels would still be low enough to support consumer spending on other goods and services." But if oil keeps rallying much more from current levels, the positive impact for energy company profits could be outweighed by a hit to consumer spending. Jessop also said that if oil prices keep rising, that could have an inflationary effect on the overall economy, lifting the prices of all types of consumer products. Of course, the next inhabitant of the White House will have an impact on oil prices too. More domestic drilling projects would likely lead to a further pullback in oil prices. But for now, the market is focused on what's on the immediate horizon for crude around the world -- and not the future energy policies of a President Clinton or Trump.